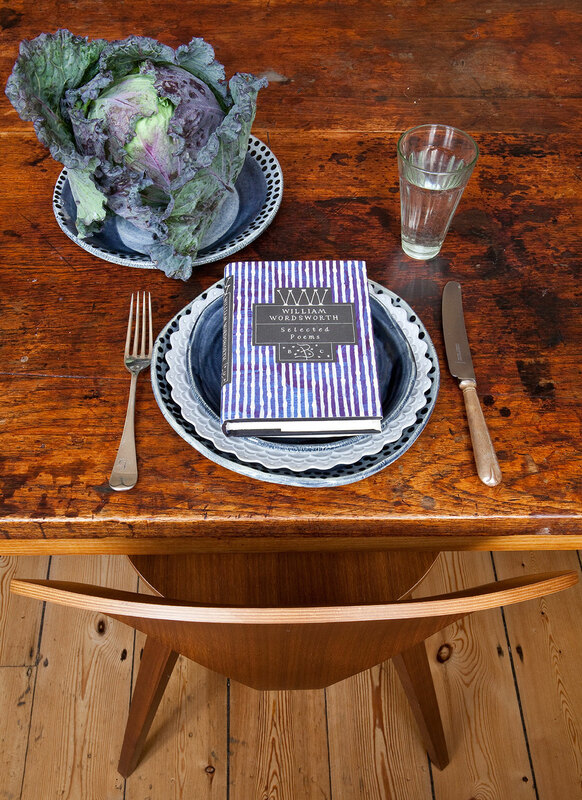 Eating with a book is one of the great pleasures. Eating while talking about books is another, and second to that comes talking about books that have eating in them. I once gave a lecture at Newnham College, Cambridge about Virginia Woolf. Newnham was the venue for Woolf’s talks about women and fiction which formed the basis for A Room of One’s Own. In it, she contrasts the grim, gravy soup that students at women’s colleges survived on and the plump partridge and sole that fuelled the men. The lunch at Newnham on the day of my lecture bore no relation to Woolf’s brown broth. I’d half-expected the kitchen staff to tip a knowing wink at A Room of One’s Own and give me a bowl of gravy. (I admit that I was in paranoid mood that day, having just been to the launch party for a new knitting book and been given blue-dyed spaghetti with bread-stick ‘needles’ poked in.) But the meal was as plentiful as it was delicious and I couldn’t help thinking how pleased Virginia Woolf would have been that the status of women, as measured by our lunches at least, had soared. I thought of Woolf, Newnham and brown soup today as I sat down to lunch with three female friends with whom I share a particular bond. All four of us started PhDs at the same time. Between us, we produced doctoral theses on Conrad, Shakespeare, Victorian feminist poetry and contemporary fiction. (One of the entertainments when doing a PhD is to marvel at the apparent insanity of everyone else’s choice of subject; my favourite is still ‘the motif of decaying flesh in the works of J. M. Coetzee.’) If there’d been a medical emergency in the restaurant and someone had shouted out “Is there a doctor in the house?” we could have yelled back “Yes, four”. Our lunch was a million miles from the parsimonious meals of Virginia Woolf’s experience; the food wasn’t particularly special but we had more laughs than I’ve had all year. Laughter is a vital component of the PhD experience, given that so much of it is gruelling, solitary, hard-dentistry and that it goes on for so, so long. Perhaps it was a lack of laughs that added to Woolf’s misery about her soup. Much as I love Woolf, her work is as thin on comedy as her Cambridge meal was thin on partridge. If she’d had three good companions to share her gruesome gravy with, she might not have noticed the food at all. It’s a shame that Woolf couldn’t join you Charlie. If there’s one person who needed a good laugh it was her. Beautiful photos again btw! I’m getting the feeling that you’re not a fan of Virginia Woolf, Boinsey. But it’s certainly true that she’s short on belly-laughs. 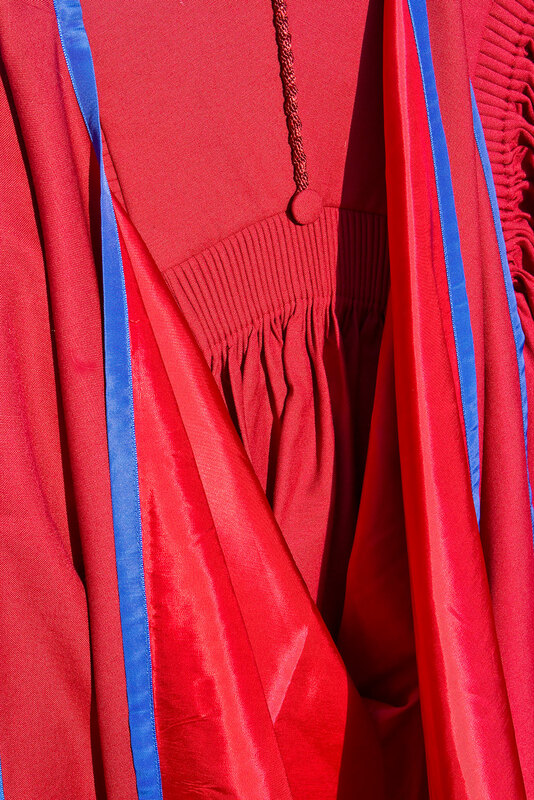 What a beautiful shot of a (hard-earned) PhD gown and a fascinating post on what must have been Brown Windsor or maybe Brown Woolf. Delighted to see that literary eating has returned to the web. I’ve never tasted Brown Windsor, but have always thought it sounds rather horrible. I think Virginia Woolf’s soup was probably even worse. Just aghast that you were “given blue-dyed spa­ghetti with bread-stick ‘needles’ poked in”! Gravy would have been preferable. Sounds like a lunch to remember. Congratulations. Someone had certainly tried to cut a dash with the food, so I will at least give them credit for that. But, as you say, gravy would have been preferable. i was surprised when you said VW has no sense of humor. then i realized my knowledge of her considerable gifts of wit, comedy and slapstick come mainly from the letters and diaries. dreadnought hoax (which i don’t find particularly funny) is probably her most famous excursion into humor. but the letters especially sparkle with wit. i commend them to your attention.